There is a number of developers that know some programming language, but adding Java and Java EE (formerly J2EE) to their resumes could increase their chances to find a better paid jobs. For example, I’m dealing with lots of Adobe Flex developers, and about half of them have no or little understanding of what’s going on the Java servers, which “somehow” respond to the requests of the well done rich Flex UI. There are legions of low-paid Web developers who know PHP and nothing else. If only they knew Java…But they often just can’t get off billing to learn Java. Besides, what does it mean to learn Java? Learning the syntax of the language? There’s no demand for people who just know the syntax of Java, or as a matter of fact any other language. So what to learn? The Java ecosystem is huge – there are lots of technologies and frameworks. People get scared. People don’t want to boil the ocean. Employers are looking for people for solid understanding of Java and Java EE technologies. So if you are looking for the guidance and are motivated, enroll in my online training class that I’ll be teaching starting from March 8. The classes will take place on Tuesdays and Fridays from Noon to 2:30PM New York time (GMT-5). Resident of the Eastern states of the USA can take a long lunch twice a week and attend these classes without leaving their offices. For people who live in Europe, India, or Middle East this is an evening training (sorry Australia, Japan, and China). You’ll be surprised, but not every person who lives in India knows Java yet. It doesn’t matter in which country you live now, as long as you have stable Internet connection (e.g. watch American youtube videos without pauses), you may benefit from this training. You’ll hear my voice and see my computer screen. You’ll be using the fresh Java Tutorial that I wrote for Wiley. You’ll be able to ask questions and do the homework. Visit this Web page for the program description and registration. Interested? Then enroll in this class and get in charge of your career. 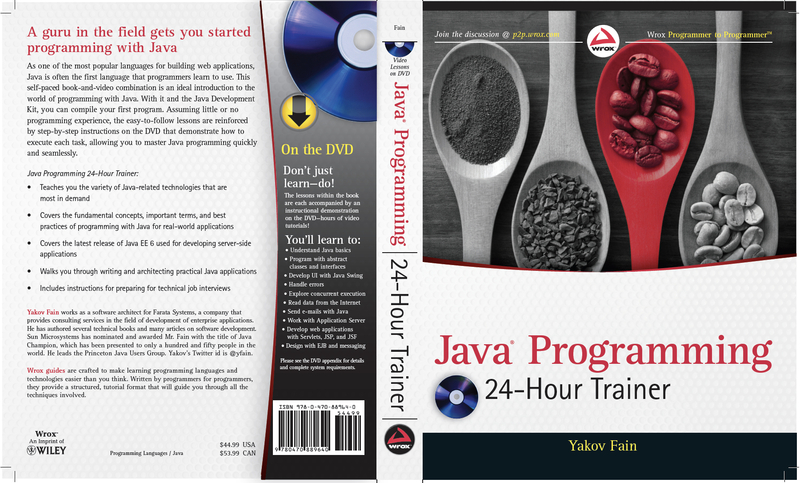 This entry was posted in Flex and tagged Java by Yakov Fain. Bookmark the permalink.